A maintenance task like cleaning your gutters is quite potentially dangerous and every home owner would try to avoid it. It certainly involves a lot of hassles and seems more difficult during the fall. Regardless of the climate that you live in, your gutter almost gets clogged with debris, pine needles and leaves. There are various Add on or Gutter Guard systems available in the market, but you need to choose them on the basis of factors like their easy maintenance, appearance, materials, the region where you reside in, effectiveness and cost. You’ll certainly need to consider these factors before you hire a professional for gutter installation or DIY. Aluminum Mesh Leaf Relief Gutter Guard for Inexpensive rated at about 83 % Efficiency! These days you may choose from a variety of gutter guard systems. The key materials involved in such systems are foam, metal mesh, nylon, plastic, aluminum and copper. All of there materials involved in your gutter guard system have their individual disadvantages and advantages. It is somewhat expensive and difficult to install copper, though it won’t rust that much. You must spend towards maintaining the sealant each year to prevent the copper going green if you want a copper-colored finish for your system. Aluminum has more longevity than both foam and plastic, costs less than copper and is quite light in weight. Types of Gutter Guards Gutter Guard Cover from Rhino Guard BEST ( with Easy On a Hot Second because of price), as it is screwed to the fascia, which gives it the most strength of all the other products overall. Two major categories of gutter guard systems are – covers and screens. Screens resemble an effective filter which lets more water through the gutters and prevents the large debris at the same time. You may choose between screens made of aluminum, foam, metal mesh or nylon during the gutter guard installation. When we inspect your home we give an unbiased comparison of gutter guards. Screens are cheaper than covers and can be installed more easily, although covers are more durable due to their relative thickness. We only recommend Surgical Stainless which is what Rhino Guard and Easy On is made of. Which we are distributors for both! Screens are either placed on the gutter or over the top, so that they’re not quite visible. Installation of the gutter guard covers is more complicated as they are much larger. They are generally made of thick plastic or metal (aluminum or copper). They’re placed over your gutters, so you need to be careful about their appearance. 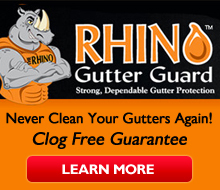 Each year, thousands of us get injured while cleaning their gutters. They’ll either slip off the roofs; get their hands sliced on the sharp ends or fall from the ladders. ‘Safety’ is one of the key reasons to install such gutter guard system. All standard gutter guards need a yearly maintenance check after they get installed. This way, you don’t have to climb up the ladder each season. In case, you choose to hire a professional for this job, make sure you inquire if they’d accept yearly checks on the basis of their installation agreement. Pick the Best Gutter Guard System for You . . . or just Let Us Help You and SAVE you the time, with our experience, and you can check us out at the BBB as we have an A+ Rating since 1967. A gutter guard system is about you and your dear home, so make sure that you be careful while determining which system will suffice your needs. Once you go through Gutter Protection reviews, you’ll find that the micro-mesh system is by far the best gutter guard system. Placed over a frame which gets extruded it is certainly the best, while the waterfall gutter with a reverse curve comes as second. You may choose a full gutter cover under circumstances when there’s a problem with micro-mesh due to extensive debris preventing it from being effective while allowing water. Get in touch with a professional installer in your locality and discuss the possible gutter guard options. This is in your best interest and will certainly help you to choose the best gutter guard system for your home. Yep . . . You can Call Jay anytime at 330-327-8787 Night or Day 7 days a week. I like helping him out with he extra hours…Really he will love to hear from you! P.S. Did I tell you he loves to wash windows . . . Just ask him and tell him T.C. told you so ! That should make him happy!!! No Replies to "Cleaning Gutters is a Real pain . . . that Needs to b e Eliminated! Guess what we figured how to do just that!"